“Sixty-six, 66!” Dorothy Sam stopped in her tracks as she thought she heard that number blaring over her walkie-talkie on the picnic table in her small makeshift outdoor kitchen. She grabbed the radio and scrambled to prepare her fish cleaning station for the 66 chinook salmon her nephew Charles Waugh claimed to have in his net. “Sixty-six, Charles?” she asked him over the radio. Sam sighed. It was the first time the family had checked their net this season. They had been patiently waiting at their family fish camp along the Yukon River for the chinook, a traditional food of the Kwanlin Dün people, to arrive. This is the first time in two years that Sam, 57, and her partner, Jeff Glaeser, 54, have set up nets in the fast flowing river. Sam and her nephew Waugh are the only reported members of the Kwanlin Dün First Nation (KDFN) trying to net chinook this summer, says the First Nation’s lands and resources manager, Brandy Mayes. Traditional salmon fishing is something all Yukon First Nations have been struggling with for the last two decades. The chinook salmon population has plummeted and the reason why is a mystery. Many speculate that it’s because of commercial overfishing in Alaska, climate change causing the waters to warm, or fungus that weakens the salmon. Whatever the reason, the small and sometimes non-existent harvests are affecting the First Nations in a big way. By not harvesting salmon the First Nations are losing their culture and identity, many First Nations members say. Sam and Glaeser decided to harvest this year, despite the hundreds of dollars it costs to do so. Glaeser said harvesting and smoking fish is especially hard work. You need to be attentive to the smoking tent at all times to make sure the salmon doesn’t become rotten. Plus, the price of gas, propane and food to keep their camp functioning for those few weeks is high. It’s also a good opportunity for family to get together for a few weeks. Sam’s nephew, Charles Waugh, and his wife, Charlene, help them fish, and she invites her friends and their children to participate too. “We all get together. We have a good time. The kids that are here are learning,” said Glaeser. They make sure no part of the salmon goes to waste. They give the eggs, otherwise known as roe, and the fish heads to the elders. Fish head soup was a staple “back in the day,” says Mayes. What isn’t edible goes to the dogs, like Sam’s two-year-old bear dog Kya. Sam says the only way to preserve traditional chinook harvesting is to get people out and learning, but she gets frustrated because youth in her community seem to have other priorities like watching television or playing video games. She says even if the youth did show an interest in salmon harvesting, they face another major problem -- the salmon population. “People need to learn how to net and clean salmon, but that’s the hard thing is that the population is going down so much,” she said. She remembers growing up on the land when the salmon were abundant in the Yukon River. “My grandma and my grandpa and my mom and dad were the last of the people that were on the land. We did sometimes stay in the village but not very often. We grew up on the land. We grew up here,” said Sam, motioning toward the ground. The small cabin that she was raised in still stands on the hill above her fish camp, located near Croucher Creek, about 10 kilometres outside of Whitehorse. Her mom, dad and four siblings would cram in the small space to sleep at night. Her grandmother’s cabin, which also remains at the fish camp, is just down the hill, and she remembers running there as a little girl to visit. When she was five, Sam attended residential school in Whitehorse at Yukon Hall, a day school for First Nations students in the North. At the age of seven, her sister Lynn, who was 10 years older, pulled her out because their mother had died. Together they learned how to net, clean, filet and smoke the salmon. “It was a staple of our diets,” said Sam. She figures they caught around 100 every salmon season, which lasted from the end of July to the middle of August. This salmon fed them through the fall and winter. Sam only attended residential school for three years. Other students were taken away from their culture for their whole childhood, from five to 18. This contributed to a profound loss of culture, identity and traditional practices like harvesting chinook, says Mayes. Five hundred and thirty-two kilometres north of Whitehorse, down the Yukon River, lies Tr’ondëk Hwëch’in traditional territory. The self-governing First Nation is having more luck getting its youth involved with traditional chinook harvesting while still struggling with the dip in the salmon population. 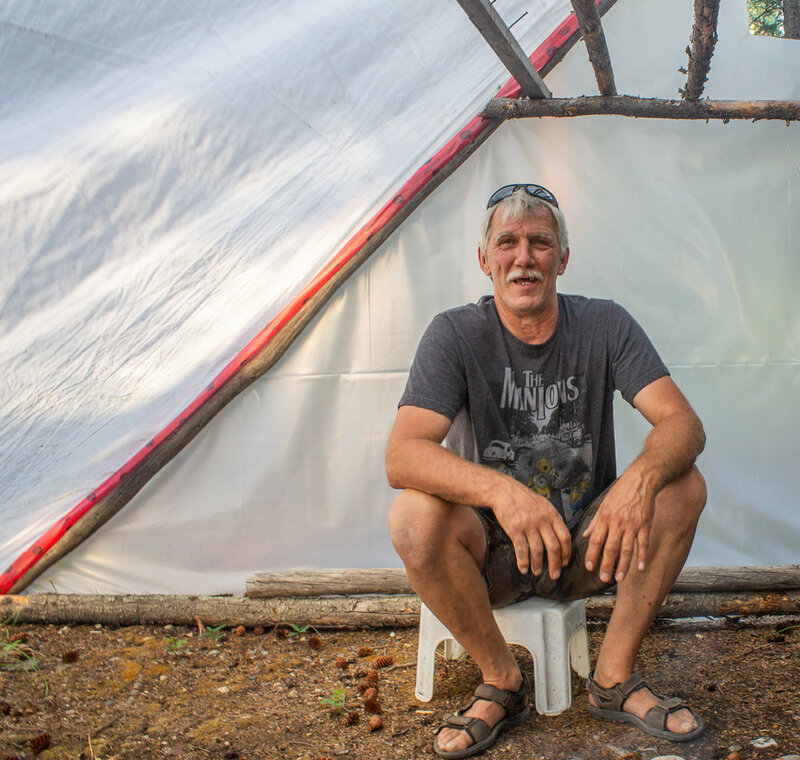 At Moosehide Village, three kilometres downstream from Dawson City, they held a first fish camp in mid-July, the first since 2013. Youth learned everything from setting, pulling and fixing nets, to cleaning, fileting and making the salmon into strips to smoke. Tr’ondëk Hwëch’in Chief Roberta Joseph said the youth harvested seven chinook salmon, fewer than the 20 they fished in 2013. But Joseph is happy they are harvesting again because the chinook also mean a lot to the Tr’ondëk Hwëch’in people. Joseph, who used to work in fish and wildlife for the Tr’ondëk Hwëch’in government before becoming chief, has noticed the declining population of salmon in the waters surrounding her traditional territory. In the early 2000s, the youth of First Fish would harvest 70 chinook in about five days, said Joseph. Then five years passed and they had to limit the catch to 35. Another five years went by and they capped the limit at 20 chinook. Then in 2013 the general assembly at Tr’ondëk Hwëch’in volunteered not to harvest in order to conserve the population, despite their rights as First Nations people in the Yukon. Joseph said throughout those years they taught the youth about the importance of conservation and alternative subsistence foods, such as the chum salmon. “We have to look at alternative methods for traditional foods because we need the salmon to maintain our good health,” she said. Chum salmon are fattier than the chinook but are still a good substitute, said Joseph. As they travel down river the fish become leaner. During the years they weren’t harvesting chinook they would catch the chum, usually in the fall, to teach the youth the traditional practices of netting, cleaning, fileting and smoking fish. Salmon are very connected to First Nations in the Yukon because they have been a key food source for thousands of years. Many First Nations in the Yukon lived a nomadic lifestyle, following the game and moving with the seasons to where they knew main sources of food were. Salmon was the largest source of food they followed, besides the caribou and moose. Large groups of people gathered in the summer to catch the spawning salmon and preserve it for the long, harsh Yukon winters, according to the Council of Yukon First Nations. Because they relied so heavily on the fish, they built an intense relationship linked to their spiritual respect for the salmon and environment. On July 24 the Yukon Salmon Sub-Committee (YSSC) released a public announcement stating that due to low numbers of fish entering Yukon from Alaska there would be no retention of chinook salmon for fisheries along the Yukon River. An exception was First Nations subsistence fishing, but even then the YSSC figured their needs would not be met. As of July 16, 158,500 salmon entered the mouth of the Yukon River in Alaska, heading for Canada. It’s estimated that between 62,000 and 84,000 will make it to the Yukon. This is better than last year's run of between 42,500 to 55,000. However, it’s still significantly lower than the long-term historical average of 150,000, according to the YSSC. Because of their self-government agreements and their right to the land and resources on it, the people of Kwanlin Dün and Tr’ondëk Hwëch’in are allowed to harvest as much salmon as they want for subsistence. Joseph knew the fish camp should only take enough to teach. Sam and Glaeser also know the importance of respecting limits. Two summers ago they only harvested 39 out of the river. This summer they will probably take fewer. Glaeser said traditional chinook harvesting isn’t even about subsistence for him anymore. Mayes, however, is confident there will be more Kwanlin Dün people out on the land and waters in the near future. As lands and resources operations manager at KDFN she helps administer the traditional territory outlined in their land claims agreement. She says that building government and administering land is a long and evolving process. She says her community wants to do it right so that the members of KDFN can get back to their traditional land. “Hopefully we can get it done soon and do it right so that we can have people on the land,” Mayes said. After developing the land, they plan to have more funds flowing in to help develop culture camps for youth. These camps will teach them everything from drying fish and netting fish, to hunting, skinning and processing moose. “It’s not very long since we’ve signed our land claims in 2005. So people are just starting to get back out and starting to get back to their culture,” she said. The chinook salmon’s life cycle starts in fresh water, like that of the Yukon River, where chinook lay their eggs, which turn into young, or “alevins.” These alevins grow for a year or two in fresh water and then begin their swim towards the sea, eventually settling into the Pacific Ocean to grow to adulthood. When the chinook reach maturity, at around four to six years, they will return from the North Pacific Ocean, near the Bering Sea region, to travel 3,000 km upstream down the Yukon River, through Alaska and back into the Yukon territory. Eventually, they will reach the regions where they were originally spawned. This two-month trip can be dangerous. The chinook often fall prey to bigger animals, overfishing or warming waters due to climate change. Since the chinook don’t eat during their long swim, instead relying on fat stores for energy, they are sometimes in rough shape after their journey. This run is the world’s largest salmon migration by numbers. According to the Department of Oceans and Fisheries, the long-term historical average return is 150,000 salmon. Since the late 1990s, however, actual return numbers now fall far below this average. This year’s return is expected to be between 62,000 and 84,000, according to the Yukon Salmon Sub-Committee. Out of many spawn that begin the journey, far fewer actually survive the entire trip. In the late 1950s, the Whitehorse Rapids hydroelectric facility was built to accommodate the growing Whitehorse community. To do this, the city built a dam, helping with power, but making it more difficult for the fish to perform their natural migration. The Fish Ladder was built in 1959 to help salmon pass around the dam. A nearby hatchery came about in the early 1980s to also help replenish salmon stocks and promote conservation, allowing the natural cycle to continue. Here is the Whitehorse Fish Ladder’s “fish cam,” where people can watch the fish enter the ladder in real time.